As September comes to an end, the streets of the Castro District fill with local vendors, artists, and performers to celebrate the diversity of the neighborhood. I am happy to announce that the 45th Annual Castro Street Fair will take place on October 7th, at the intersection of Market and Castro in the city of San Francisco. As the center of the LGBTQ world, the fair is one of San Francisco’s most important and cherished pride events. From the music of the Main Stage to busting-a-move in Dance Ally, come prepared to have a full-on street party because the festival lasts all day and well into the night! Established in 1974 by activist Harvey Milk, the first Castro Street Fair attracted more than 5,000 individuals. Milk started the fair in reaction to the discriminatory policies of local merchants. 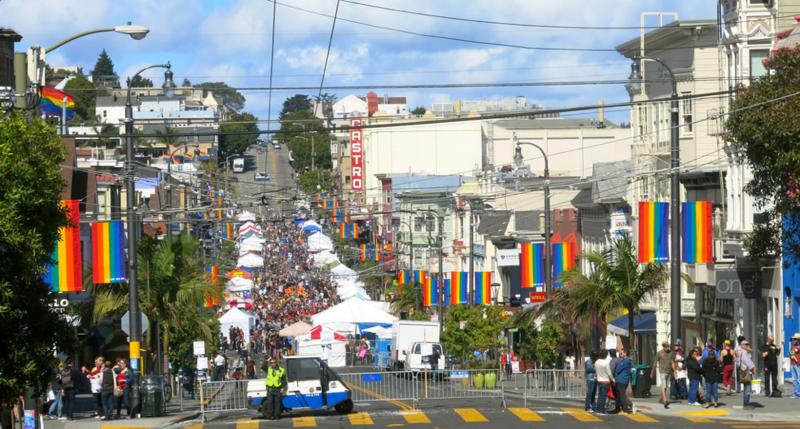 Since then, the Castro District has transformed into the center of the LGBTQ community and the fair became a focal point in the civil rights struggle. The fair is a showcase of creative talent. It takes over the entire heart of the Castro District, extending for four blocks along 18th Street. The fair will offer live entertainment and dance stages scattered throughout the fairgrounds, hundreds of artisan stalls from clothing to unique San Francisco items, and local eateries that offer delicious and creative options. The fair is a nonprofit organization and all the proceeds go to the important causes of the Castro community. Although the event is free to attend, a suggested $10 donation goes to fund and maintain the rainbow-colored flag that flies over the Harvey Milk Plaza at the intersection of Castro and Market. If you want more information about donating, history, or how to volunteer on the 7th check out https://castrostreetfair.org.